U2 hit the stadium trail once more and we were there to witness it. In every relationship one has to go through one’s up’s and downs, and for the U2 faithful the rather generous free gift of depositing their 2014’s album “Songs Of Innocence” into half a billion peoples unsuspecting music collection was the equivalent of getting drunk at the office Christmas party and copping a feel at someone in the accounts department. It all felt rather sordid and messy. So how do you heal after that and fall in love all over again? The answer is pretty simple. Announce a tour to 2.4 million people showcasing the one album that 30 years previously resonated with your fans and broke the band into the stadiums around the world. Turns out actually this was a pretty smart move. The Grammy winning “The Joshua Tree" record made the world have a collective crush on them in the first place and tackled political issues that seem even more relevant now than they did in 1997. And so, on the second night of 2 sold out shows at Twickenham, it is the lone figure of Larry Mullen Jnr who strolls out onto the stage on Sunday evening before launching into “Sunday Bloody Sunday”. Can there be a more famous opening drum riff? The rest of the band follow with Bono bringing up the rear egging on the crowd up like a frustrated boxer. Wisely bookending either end of the show with pre and post Joshua Tree hits, "New Years Day", “Bad" and “Pride (In The Name Of Love”) all follow the opener and all played out on a tiny stage and without any pomp and ceremony. 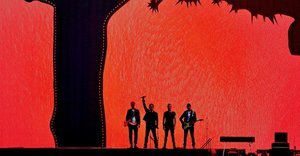 The tiny “B” stage forms a perfect shadow for the HUGE 200 x 40ft 8K video screen and accompanying Joshua tree cut out spanning the stadium. The “no frills” move is smart and means the entire focus of the 60,000 strong are on the band before the chiming opening chords of “Where The Streets Have No Name" signalling “The Joshua Tree” section of the show. Its an impressive start and no less because the start of the album also signifies the flicker to life of the giant hi res screen projecting images of Zabriskie Point and The Joshua Tree park shot by the bands faithful movie maker Anton Cobain who first worked with the band on the album 30 years ago. The album is played chronologically and in its entirety. This of course means the first 3 tracks are the hits and everything that follows is therefore arguably less known but thankfully for both band and audience none the less epic . There’s even the chance for some wry humour along the way as prior to “Exit” a 1950’s black and white TV footage is broadcast. In it there features a loser named Trump who declares he can save a small town by building a wall drawing boos from the crowd with a sly dig at the reality star president of the USA. After 12 tracks its all over the band leave us with the and the stunning and understated first act closer of “Mothers Of The Disappeared”. In every relationship your allowed at least one misstep and U2 are no exception. 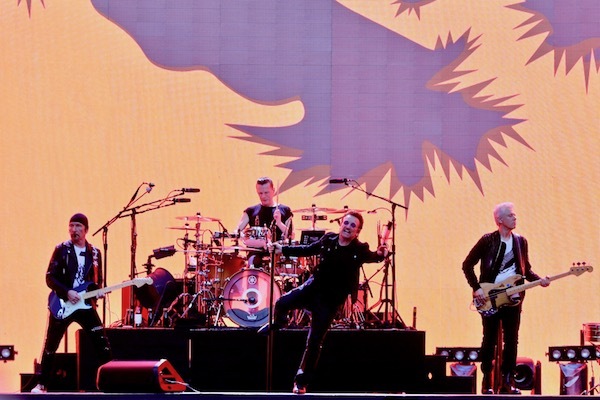 If “Songs of Innocence” signalled their annus horribles (though it has to be said the accompanying tour was stunning) then “The Joshua Tree” 30 years on must surely signify a turning point once again for the band. This doesn’t feel like any kind of nostalgia trail blaze. The band announced they want to perform it as if the album was being released this week and that’s exactly what it feels like. It’s a band and audience falling in love with each other all over again. Bring on the new album and this time make ‘em pay for it! All photos by @davidcourtphotography - follow on Instagram for U2, Glastonbury and other sordid gig shots.